With the start of the new year, comes the arrival of any and everything health and wellness related. 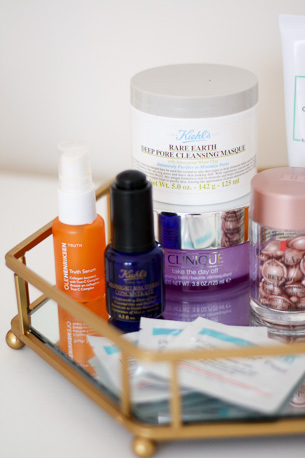 With that being said, I thought what better time to share my updated skincare routine with all of you! Over that past couple years I've really been focusing in on my skincare routine. It is something I feel is so very important for not only your skin today , but also your future self. Skincare can be an investment and isn't always the cheapest, but it is an investment I think is worth making every time. Your future self will thank you! 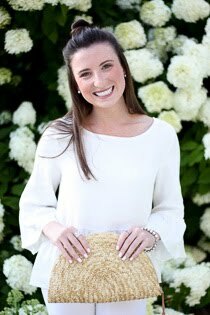 Of course there is no set in stone skincare routine that will work for everyone and different skin types have their own set of unique needs, however I still wanted to share what I've been doing over the past few months. Not only is it a consistent routine I've been sticking with, but I also have been more than pleased with the results! I keep getting complimented on my skin, and can't help but think it has something to do with the products I'm using and how I'm using them. So without further adieu, here is my current skincare routine. Enjoy! I then complete the routine with a vitamin C serum followed by a day-time moisturizer. If there was only one product, other than a face wash & moisturizer, that I would insist on incorporating into your routine, it would be vitamin c serum. Talk to any and all dermatologists and I am confident that they will recommend this as well. With benefits including fine line and dark spot reduction, promotion of collagen production, and overall brighter skin, who could say no! To wrap up my morning routine, I end with a gel moisturizer and a brightening eye cream. I'm currently loving this moisturizer (also contains vitamin C) and this eye cream. P.S This entire routine takes at maximum about five minutes. Super easy & fast - who doesn't want that! In my opinion, the first & most important step at night is removing your makeup ... and really removing it. The one and only product I will use to remove my makeup is Clinique's take the day off cleansing balm. It is truly the only product I've used that actually removes all of your makeup. I then follow that with washing my face with origins face wash, and then the next steps differ based on what day of the week it is - see below! 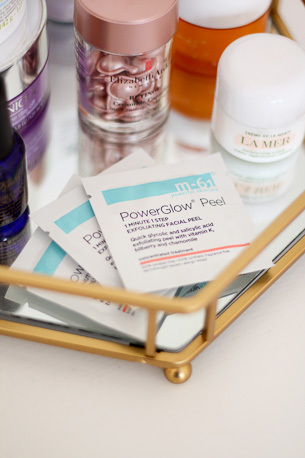 On these nights I will follow washing my face with a M61 PowerPeel Pad. I've talked about these on the blog before, and they really are the best. See this prior Faith & Fancy post to hear more about them! On Tuesdays and Thursdays, I use the Elizabeth Arden ceramide retinol serum. This is a newer addition to my routine, so I will do a more in depth review next month, but so far so good! 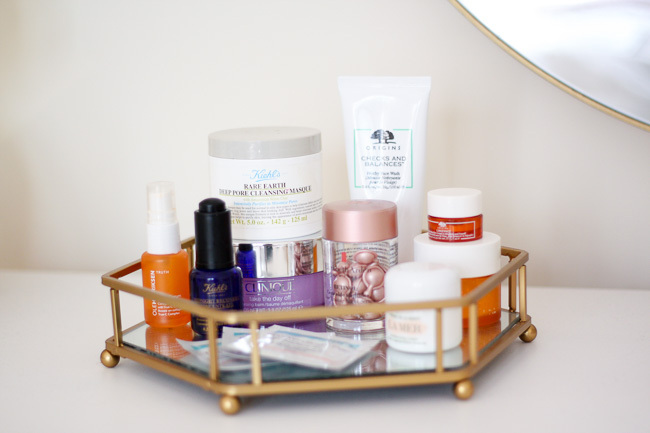 Retinol has long been known as the gold standard of anti-aging products, and although at twenty five my skin isn't exactly showing signs of aging, I figured it's never a bad thing to be proactive. Retinol can tend to be a bit drying to the skin, which is why I decided to start with using it only two nights a week. Okay, back to the rest of my evening routine! This is what I do regardless of the night of the week. Once I finish treating my skin with either the Power Glow Peels or the retinol serum, I complete the process with a moisturizer. 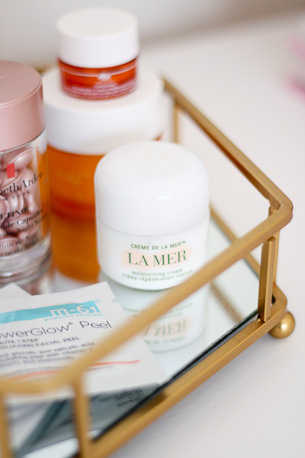 I recently started using La Mer moisturizing cream because I was dying to see if it lived up to the hype. In my opinion, it most definitely does. I understand why it gets all the praise that it does! However, I also have always been very loyal to Origin's Night-a-Mins night cream for many years. It is another tried and true favorite if you're looking for a good night moisturizer. One last product I use as needed in the evening is the Kiehl's midnight recovery oil. It is amazing and provides the best moisture & dewiness to my skin. I don't use it every night, but probably a few times a week when I'm feeling my skin needs a little extra moisturizing. If you have skin that is on the drier side, I would recommend incorporating this into your night time routine! To be honest I keep Saturday routine pretty simple! I do my normal morning routine and then at night I simply cleanse my face and use a moisturizer. 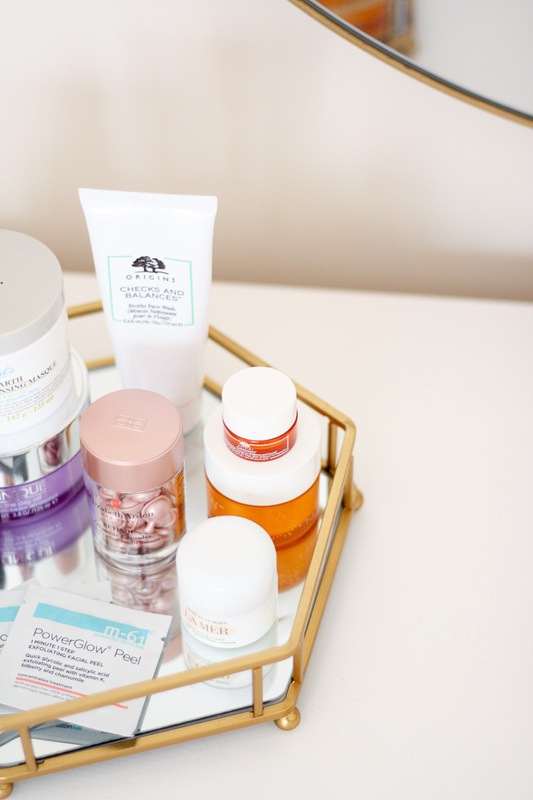 My evening routine is the same as during the week, just without the power glow peels or the retinol serum. The only exception to this is that I will sometimes use an exfoliating scrub or mask if I feel like my skin is looking dull. It instantly does the trick by brightening and bringing some life back into my face. I love both the Origins original skin retexturizing mask and the Rodan + Fields microdermabrasion paste. Sunday is probably my favorite day for skincare! I keep my morning routine the same as during the week, but I switch up my evening routine. I try to give my skin a little extra TLC as we end the week and it makes me feel good heading into a fresh, new week. Sunday nights involve cleansing my skin, and then using Kiehl's deep poor cleansing masque. I then finish it off with the Summer Fridays jet lag mask which quickly became one of my favorite masks. I love love love the consistency of it and how hydrating it is. I lather it on and then leave it on overnight for maximum effect. 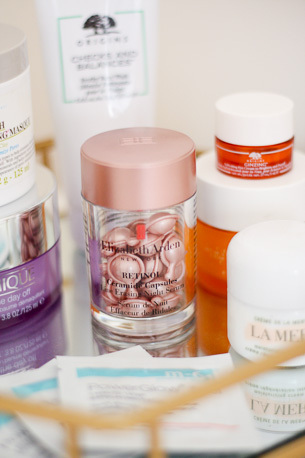 My skin is never happier than it is on Monday mornings! I seriously look forward to my Sunday night routine all week long!